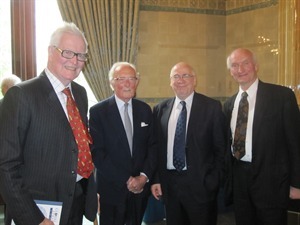 Professor Sir Lawrence Freedman, Professor of War Studies and Vice Principal, King’s College London gave our May lecture entitled, ‘After Iraq and Afghanistan: The Future of US Military Strategy?’ in an event chaired by Lord Anderson of Swansea on Monday 14th May. Professor Sir Lawrence Freedman gave an authoritative and incisive analysis of the future challenges facing US military strategy after Iraq and the likely ‘messy conclusion’ of Afghanistan. He described a militarily ‘tired’ and ‘uncertain’ US and pointed out that the ‘pivot’ or rebalancing away from Europe and to the Asia Pacific was not about an ‘enormous shift of resources into the Asia Pacific or a major US build up there’, but rather a reduction of resources in Europe. He outlined the ‘dangerous’ tensions building up in the Asia Pacific region, and the complex strategic relationships developing as a result. However, since being a global power ‘requires as many responsibilities as entitlements’, he saw China as a very important regional power with global interests, rather than a global superpower, since it had neither the ‘ideological outreach and influence of the United States’, nor allies. The US would have to think about the question of how it would meet the demand for the region to balance the power of China; and the big issues in the South China Sea that could potentially lead to trouble. In advance of the forthcoming NATO summit in Chicago, Professor Freedman believed that the power of NATO lay in its very existence, and that in times of crisis in international affairs, having an alliance already in place was key. The summit therefore most usefully needed simply to reaffirm the importance of NATO’s existence. He described how the concept of humanitarian intervention had become accepted in the 1990s and the development of the R2P doctrine from there, yet pointed out that the relatively ‘small beer’ Libya campaign had ‘almost exhausted us’. He posited that with budgets tight, preoccupations would become much more local, and that maybe the 1990s might turn out to be an anomaly. To listen to the lecture, please click here.